Successfully Added Android TV Box Sunvell T95Z Plus - 4K Resolution, Dual-Band WiFi, Google Play, Kodi TV, Octa-Core CPU, 3GB RAM to your Shopping Cart. With the Sunvell T95Z Plus TV box, you’ll be able to experience a cinematic experience from the comfort of your own living room. Supporting 4K resolution, this Android TV box is capable of portraying all your favorite movies in absolutely breathtaking quality that is guaranteed to blow your mind. Bringing forth vivid color and stunning detail, you’ll be able to enjoy movies, series, and games like never before. Sit back, relax, and let this 4K TV Box take you away into a world of mobile entertainment. With this smart home accessory at your side, you and your loved ones will never experience a moment of boredom again. 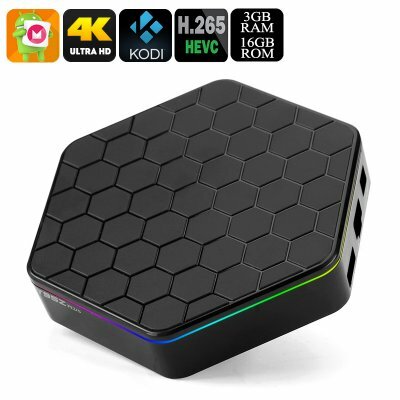 Featuring a cool hexagon shaped design and intergraded LED color lights, this Android TV box is a true asset to the interior or any modern household or game room. Within its stylish body, it packs the epic Amlogic S912 processor. As an Octa-Core CPU, this piece of hardware has been designed to deliver a powerful performance capable of dealing with the most demanding of tasks. Additionally, it also comes with 3GB RAM, allowing you to multitask and enjoy numerous of its Android features at once without experiencing any lag. Whether you’re into online gaming, Android Applications, 4K movies, or simply like to browse the web – this 4K TV Box is there to meet all your demands. Coming with 16GB of internal storage and a 32GB SD card slot, this Android TV Box packs plenty of space for you to store all your downloaded media. With access to the Play Store and Kodi TV, you’ll be able to download freely millions of the latest Android applications, movies, series, and games – providing you with an unlimited pool of mobile entertainment. Whether you like to spend a relaxing evening at home with the family, or invite over your friends and play some games or watch a live sports event – this TV box will bring along unlimited entertainment. Its Dual-Band WiFi connectivity lets you browse the web at lightning speeds and download the latest media in the blink of an eye. Coming with the ARM Mali-T820MP3 graphic’s unit, you can be assured that all your downloaded movies and games will be displayed with the highest levels of graphics – guaranteeing a truly cinematic experience. The Sunvell T95Z Plus TV box is the perfect 4K Smart Home accessory that helps you to entertain friends, family, and loved ones for years to come. Arabic: - مربع التلفزيون ك 4 - Chinese Simplified: - 4 K 电视盒 - Czech: - 4K TV Box - Danish: - 4K TV boks - Dutch: - 4K TV Box - French: - Boîte de TV 4K - German: - 4K-TV-Box - Hebrew: - תיבת טלוויזיה 4K - Hindi: - 4K टी वी बॉक्स - Italian: - Box TV 4K - Japanese: - 4 K テレビ ボックス - Korean: - 4 K TV 상자 - Malay: - Peti TV 4K - Norwegian Bokmål: - 4K TV boks - Romanian: - Caseta de TV 4K - Russian: - 4K TV Box - Spanish: - 4K TV Box - Thai: - กล่องทีวี 4K - Turkish: - 4K TV kutusu - Vietnamese: - 4K TV Box -.